Tom Hanks may be playing the part of a symbologist named Robert Langdon in the soon to be released film Angels & Demons, but the character is actually named after John Langdon, the typographer. John Langdon was approached by Dan Brown’s father—an admirer of Langdon’s work—and asked to prepare an ambigram for his son’s next album release (apparently, Dan Brown’s singing career wasn’t as successful as his writing). 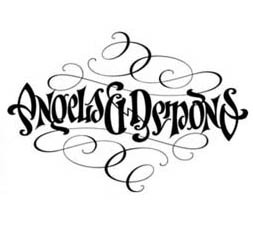 The album’s title was Angels & Demons. Ten years later, Brown asked Langdon if he could use the ambigram again, but this time it was for a book. Ambigrams are logotypes designed to read the same whether they are upright or upside down. These became popular through Brown’s stories. After designing a few more of the typographic puzzles for the book, Brown showed his appreciation for Langdon’s skill by naming the main character after him. To learn more about ambigrams and see some examples, read this article by John Langdon.